The piping plover (Charadrius melodus), a sparrow-sized, coastal dwelling bird, is a true North American treasure. Found only along the Atlantic coast, surrounding the Great Lakes, and on the alkalai flats of the northern Great Plains, the piping plover derives its name from the bell-like whistled peeps it uses for communication. The inland populations are endangered and the coastal population is listed as threatened according to the Endangered Species Act of 1973. Piping plovers were common along coasts until the late 19th century, when the birds’ downy, sand-colored feathers were sought after for the hat-making trade. Because of excessive hunting of plovers and other birds, the United States passed the Migratory Bird Act of 1918. This law served to bolster the piping plover population until mid-century when the birds’ welfare was once again at risk, this time through the increased development and recreational use of beaches. 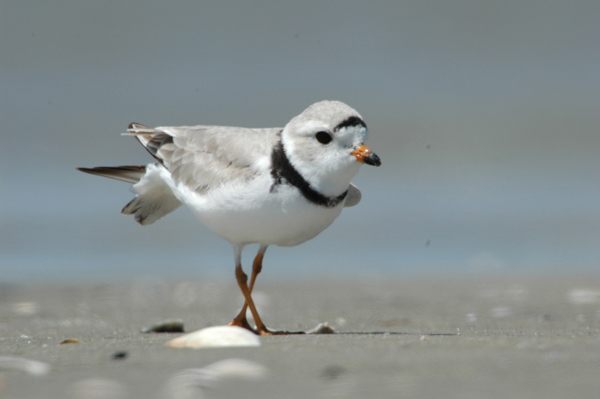 Piping plovers are especially susceptible to human disturbances because they are ground nesting birds that make their home on open, sandy shorelines—the same beaches people value for residential and commercial development. Not only is there habitat loss, but breeding and rearing success is threatened by vehicular and foot traffic, increased predator populations attracted to human refuse, and unmonitored pets. Changes to coastal ecologies also impact the birds’ prey populations (insects and small aquatic invertebrates) and modifications to shoreline topographies may make nests more vulnerable to tidewaters, storms, and winds. Piping plovers are monogamous and share incubation and most rearing duties; however, the egg-laying process itself is long and treacherous for the unhatched offspring. About four eggs are laid over the course of 6-7 days but the nest is not usually incubated during this week-long process. The unmonitored eggs are well-camouflaged which offers some protection, but with increasing traffic nests are often crushed unknowingly or abandoned by the plover parents if overly disturbed. The U.S. population has nearly tripled in the years since they were first proteced under the Endangered Species Act, growing to 1,550 pairs in 2011. You can do your part in protecting these endangered birds by respecting dunes and other marked nesting areas of coastal animals, educating others about the threats to shoreline ecosystems, and advocating for the protection and ecologically sound development of beaches and surrounding areas.